The FM Alert system will allow almost instant communication between the public and emergency personnel. When the program is in full swing, every residence will have a small receiver that can be activated via a radio signal and large public buildings such as schools will be outfitted with larger receivers. When activated, these units sound an alarm, exhibit a flashing red light, and display a brief digital message indicating the nature of the emergency. The township has been divided into eight areas and the system will be instituted in stages, with the most vulnerable areas in Corunna being the first areas to be activated. This system will replace the telephone call system, which proved to be insufficient to the needs of the township. 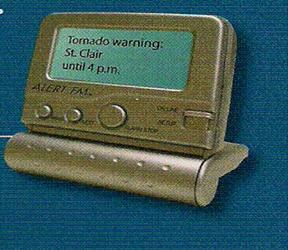 The FM Alert system will be operated in partnership with Blackburn Radio and St. Clair County, Michigan. St. Clair Township Fire Chief Roy Dewhirst says this is ideal since severe storms usually track through St. Clair County first. This allows for a timely warning to be issued and allows residents to take immediate, appropriate action. Each residential unit is worth $30, but the municipality will be subsidizing its purchase by two thirds. The units are be available at the Emergency Services building at the corner of Lyndoch and Hill Streets in Corunna, at the St. Clair Township Civic Centre in Mooretown, or at the Corunna Home Hardware.